Figure Skater Nathan Chen, an 18-year-old first time Olympian, arrived at the 2018 Winter Olympics in PyeongChang as one of the top American athletes favored to win gold for Team USA. The rising star -- best known for his impressive ability to spin off several quadruple jumps per competition -- achieved win after win this season, making him a formidable addition to the United States’s men’s figure skating team with Adam Rippon and Vincent Zhou. With the Opening Ceremony in PyeongChang set for primetime on Friday, February 9, there’s a good chance you’ll be seeing and hearing a lot more about Chen before he even sets a skate on the Olympic ice. Here’s a quick breakdown of what you should know about him and his extraordinary figure skating career thus far. Chen, the youngest of five children in a family from Salt Lake City, decided he wanted to figure skate when he was just 3 years-old. His family didn't have the money to buy him a pair of skates of his own, so he made his skating debut wearing a hand-me-down set from his sister. When he grew out of his sister's old skates, Chen finally got a pair of his own after his father turned to foundation run by two-time U.S. Olympian and three-time national figure skating champion Michael Weiss for a contribution of $200. Although Chen was too young to apply for an actual scholarship at the time, Weiss pitched in to help kickstart the boy's skating career anyway. But the foundation's financial assistance -- and support to keep Chen in the sport -- didn't end there. As Chen practiced, progressed, and competed in tournaments over the course of the following 10 years, Weiss' charity provided him with a total of $75,000 in financial assistance, according to a report by USA Today. Chen also credits his parents -- his mom, especially -- for supporting and shaping his career. "My family and parents were very influential in my skating career," he said in a statement provided by the US Olympics Committee and NBC Olympics. "My Mom spent most of her free time driving me around, spending time on the ice, and watching me skate. My mother was the most influential person in relation to my career. She was the one who helped me begin skating and help me find my love for the sport, as well as push me through the hard times." 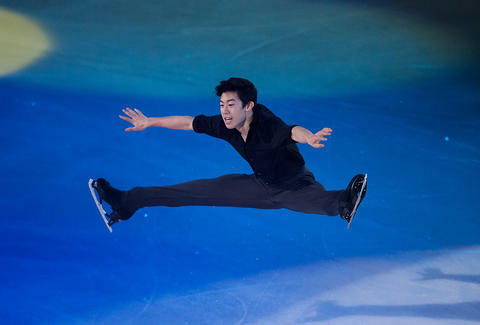 He's been called the "Quad King"
Chen became the first figure skater to land five quadruple jumps in one program last year during US Nationals, instantly earning himself the title of "Quad King." In case you're wondering, quadruple jumps -- often referred to as "quads" -- are when a skater jumps and makes four full revolutions in the air. As you can see in a video of that competition (shown above), he lands each one with spectacular skill. Going into the 2018 Winter Games, however, Chen said his goal is to focus on the bigger program performance rather than specific components such as quads by focusing on his artistry and footwork. It's probably more than safe to say you should expect to see a handful of the spectacular jumps in PyeongChang, though. There's a good reason why Chen is poised to take home gold from PyeongChang 2018: he's been crushing it this season. Last month, he took first in the U.S. Figure Skating Championship, his second win there, and he won the Grand Prix Final back in December. The last male figure skater to take the latter title was Evan Lysacek in 2009, who went on to win gold at the 2010 Winter Olympics in Vancouver. The string of victories saw Chen finish the season and head to the Olympics undefeated, according to a report by The Washington Post. Millions of Americans got a glimpse of Chen's journey to the Olympics in one of a series of minute-long "Best of the U.S." commercials NBC aired during Super Bowl LII on Sunday. The spot (shown above) shows Chen practicing -- falling, getting up again, falling, getting up and killing it -- in the lead up to the Winter Games. "I've put in the work," Chen said in a tweet featuring the commercial. "Now I'm ready for the lights." "I think it's sort of expected, but most athletes prepping for the Olympics go through extensive planning out of the weight room and/or training venue where they plot out the data and plan out the dates and time periods to train hard or recover," Chen said. In addition to the training and planning, Chen has also worked on building his confidence for when he hits the ice while the whole world is watching. "I want to challenge myself as much as I can and be at my very top shape by the time the games come around," he said. "Of course a podium finish would be a goal, however, I want to make sure that I am as confident and ready as I've ever been and I believe I can get the results I want if I train and plan properly." Tony Merevick is Senior News Editor at Thrillist and can't wait to watch the Olympics this year. Send news tips to news@thrillist.com and follow him on Twitter @tonymerevick.